Sarah Reese, the teenage daughter of a powerful Washington, D.C. judge, is dead, her body discovered in a slum in the shadow of the Capitol. Though the police promptly arrest three local black kids, newspaper reporter Sully Carter suspects there’s more to the case. Reese’s slaying might be related to a string of cold cases the police barely investigated, among them the recent disappearance of a gorgeous university student. A journalist brought home from war-torn Bosnia and hobbled by loss, rage, and alcohol, Sully encounters a city rife with its own brand of treachery and intrigue. Weaving through D.C.’s broad avenues and shady backstreets on his Ducati 916 motorcycle, Sully comes to know not just the city’s pristine monuments of power but the blighted neighborhoods beyond the reach of the Metro. With the city clamoring for a conviction, Sully pursues the truth about the murders—all against pressure from government officials, police brass, suspicious locals, and even his own bosses at the paper. A wry, street-smart hero with a serious authority problem, Sully delves into a deeply layered mystery, revealing vivid portraits of the nation’s capital from the highest corridors of power to D.C.’s seedy underbelly, where violence and corruption reign supreme—and where Sully must confront the back-breaking line between what you think and what you know, and what you know and what you can print. 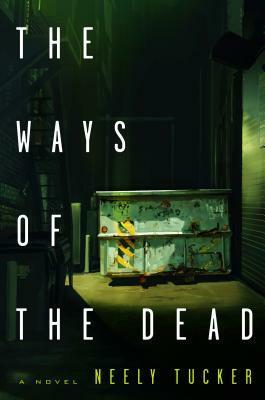 Inspired by the real-life 1990s Princeton Place murders and set in the last glory days of the American newspaper, The Ways of the Dead is a wickedly entertaining story of race, crime, the law, and the power of the media. Neely Tucker delivers a flawless rendering of a fast-paced, scoop-driven newsroom—investigative journalism at its grittiest. I don't tend to gravitate towards murder mysteries, but I'm always game for trying new and unfamiliar things. As you can probably tell from my blog, my reading taste is all over the place. I have favorite genres, of course, but I love reading a wide variety of books. When I was contacted about reading and reviewing The Ways of the Dead, I knew I couldn't pass it up. The cover immediately caught my eye - the shadowy darkness with only the dumpster illuminated gave off such a suspicious and sinister vibe. I was curious about the story before I'd even read the summary! The description intrigued me because it's not a police procedural, which was what I expected. This book tells the story from a different angle entirely: the investigative reporter covering the case. Neely Tucker, the author, is a veteran journalist and based this story on the real-life 1990s Princeton Place murders. I love fiction inspired by real life, even though I wasn't familiar with those murders before reading this book. The Ways of the Dead introduces readers to journalist Sully Carter. When the daughter of a powerful Washington D.C. judge is found dead, Sully is one of the first reporters to cover the case. The deceased is a young white girl who was murdered in an "unsafe" area, and the primary suspects are three black teenagers. Sully's sources indicate there is more to the story and everything isn't quite so cut-and-dry. However, the intersection of truth and perception is a tricky thing to navigate, particularly for a newspaper. Sully realizes there have been a string of deaths in this area over the last few months: all women of color, from the wrong side of town and suspected of doing drugs and selling their bodies to pay for their habit. Sully thinks the deaths are related, but he'll pursue this story against pressure from almost everyone around him. Locals won't talk for fear of being seen as a snitch. Police don't want to cause a panic. And Sully's bosses won't put the paper on the line for an unproven theory. I loved that this story was told from a journalist's perspective, and Tucker's history as an investigative reporter was evident throughout the book. I thought Sully's involvement in the case, research in the community and conversations with his sources seemed so realistic. I also liked the behind-the-scenes look at the media's role and power in the conversation surrounding a crime. This book was more than just entertaining - it made me think about the world around me and the extensive influence of the media. I won't reveal anything about the case, but I will say that I really enjoyed it. The characters were well-developed - believable and complex. There are shades of gray in these characters and in this case, which I really enjoyed. In the search for sources, Sully must question the credibility of each and decide for himself who to trust and what to pursue. Additionally, I found the racial tension to be heartbreaking but particularly timely considering a few recent high-profile cases. The juxtaposition of people in power with the poor on the fringes of the city added a fascinating layer to this story. I was too young in the 1990s to really be aware of the political climate, but I thought Tucker did a great job at portraying D.C. during this time period. I appreciated the fact that the setting didn't overshadow the case but certainly played a role in it. The story opens with a punch, slows down a bit and then gradually gains speed again as the case draws to a close. It took me a little while to really get into the book, and I felt like the last third was probably the most gripping part of the story. Either way, it was still a fast read with nicely placed twists and turns. It ended in an intriguing way and definitely left me curious about future books in this series. Despite a slow beginning, the story ultimately won me over and kept me intrigued. The focus on the media and race is what made it stand out the most for me, particularly after I read this Washington City Paper article from 1998 about the Princeton Place murders. The article gave me even more insight into Tucker's inspiration and made me really appreciate the way he told this story. If you like mysteries or thrillers that will also make you think, I'd certainly recommend The Ways of the Dead. "But his job, and his problem, was that he had to get ahead of her and the detectives and the federal agents swarming over this, putting their stamp of What Happened Here on it all." *I received a copy of this book from Penguin in exchange for an honest review. I was not compensated in any way for my review. I have a secret love for murder mysteries, so this sounds like a great book, that I wouldn't mind reading! The fact that it's based on a true story though - that totally adds another dimension to it! Thanks for the review/recommendation! The Ways Of The Dead sounds really interesting -- like you, sometimes I like to try to read in different genres and murder mystery is rarely my genre of choice. I love when books make me consider things like the media's influence and how it colors our perspectives of current events as well as past events. Ooh! I'm not a big murder mystery reader, I'll admit, but I'm usually willing to try books in most genres! I just like the fact that this one tackles the case from the perspective of a reporter. That already makes it interesting, and the addition of other elements (like race) add to that. Glad you wound up enjoying this!